Cornerstone Farms offers instruction throughout the entire year. Our emphasis is in Hunters & Jumpers. The first beginner lessons will be in a private format and last 45 minutes each to allow the student time for learning to groom and tack up themselves. With each new lesson our students gain confidence and independence in preparing their horses for the mounted portion of their lesson while also learning the basic riding skills they will need for a group setting. This format allows for lunging, which allows the instructor to control the horse so the student can focus on learning proper position, balance and rhythm. As students progress, they will not only become more independent in grooming and tacking up, but will also be rewarded with more time in the saddle as their horsemanship skills grow. Students begin in a 45-minute session, allowing for teaching time on the ground, covering grooming, tacking up and cooling out. Before long, students will be able to meet their instructor at the mounting block, tacked and ready to go at lesson start. At that point, they will have 30 full minutes of time in the saddle. Our group lessons consist of 3-7 riders, or Semi-Private groups of 2, arranged by skill level, chosen discipline and age whenever possible. Students wishing to join a group lesson must have begun cantering, be able to keep their horse to the rail, tack up independently, and be in full control of steering and stopping their horse at all three gaits. 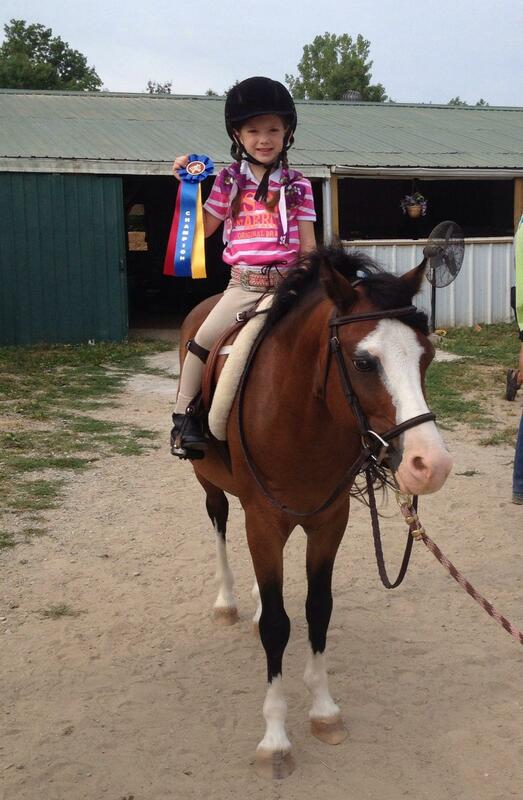 We offer leadline lessons for our youngest students. Riders are taught proper equitation and position, some ground handling and grooming, as well as work on a lunge line as lessons progress. Lessons are 30 minutes in duration and taught in a private format. When students can demonstrate control of their pony, they are encouraged to move up to the regular lesson format, regardless of age.